Step 2 Add the chicken broth and bay leaves then raise the heat to high. Once the liquid has come to a rolling boil, add the rice, salt and pepper. Turn the heat to medium-low and simmer for 20 minutes or until the rice is tender. Now stir in the cooked chicken. Step 3 To prepare the egg-lemon sauce, in a medium bowl, whisk together the lemon juice and eggs. While whisking add 2 ladles-full of the broth from the cooking pot (this helps temper the eggs). Once fully combined, add the sauce to the chicken soup and stir. Remove from the heat immediately. Step 4 Garnish with fresh parsley, if you like. Serve hot with your favorite bread. Enjoy! It’s a good day for a classic Avgolemono Soup Recipe. 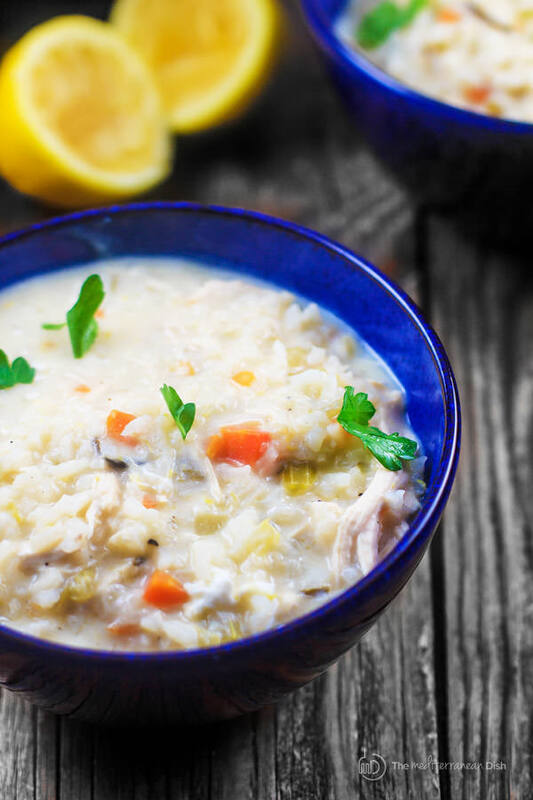 Avgolemono soup is basically a Greek lemon chicken soup that is thickened with an egg sauce. With rice and vegetables, it’s a meal in itself; or a great starter to your next Mediterranean dinner!